The 24.9 x 34.0 cm (9.8 x 13.4 in.) enclosure houses the EC100 electronics and the CR6 datalogger attached to the lid of the enclosure. 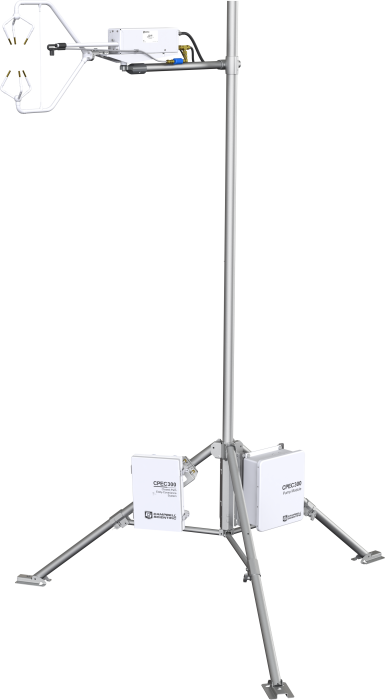 The CPEC300 enclosure can be mounted to a tripod mast, CM106 tripod leg base, tower legs, or a large-diameter pole. The pump module, a standard component of the CPEC300 system, consists of a small dual-head diaphragm pump with a brushless dc motor mounted inside a fibreglass enclosure. An integral cable connects the pump module to the CPEC300 system enclosure, which provides power, temperature measurement and control, pressure measurement, and pumping speed measurement and control.